The 2011 Gettysburg National Military Park Quarter 100-Coin Bag will be issued by the US Mint and contain 100 circulation quality strikes of the sixth coin to appear as part of the America the Beautiful Quarters™ Program. These strikes will also represent the first of the program to be issued in 2011 which debuted a year earlier. Included in the bag will be 100 Gettysburg National Military Park Quarters struck at either the US Mint facility in Philadelphia or the US Mint facility in Denver – buyers choice. Four more America the Beautiful Quarters will be struck in 2011 followed by another 46 in the next nine years. Aside from the 100-coin bags shown here, the US Mint will also produce many other products containing the Gettysburg coin including two-roll sets, proof and mint sets, etc. Each bag will be imprinted with the contents of "U.S. Mint Quarters $25.00." A special label will be sewn onto each bag indicating its specific contents of Gettysburg Quarters and which Mint facility they were produced at. The US Mint released the Gettysburg 100-Coin Bags on January 27, 2011. 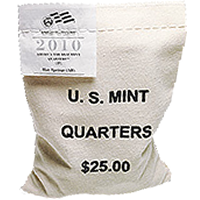 The US Mint charged $49.95 per 100-coin bag. Shown on the reverse of the strike is an image of the 72nd Pennsylvania Infantry Monument. The reverse was designed by Joel Iskowitz and sculpted by Phebe Hemphill.